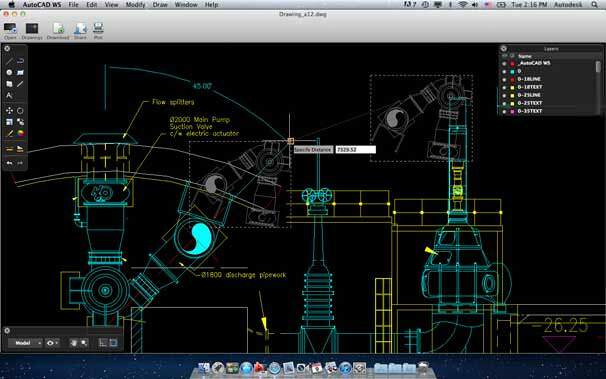 AutoCAD WS for Mac is a free CAD application that enables you to view and edit DWG and DXF files. AutoCAD WS for Mac app offers a basic, intuitive set of viewing, editing, and markup tools to work on AutoCAD designs. Open your files in AutoCAD WS for Mac app and upload them to your online account to sync them with your AutoCAD WS mobile app so you can take them with you on the go. Plot your DWG files as a PDF or DWFx with full control over plot styles, paper sizes, layouts and more. Drawings can also be saved locally so you can work without an Internet connection. If you need more information please contact the developers of AutoCAD WS for Mac (Autodesk, Inc.), or check out their product website.